Repeatedly in late February, 2013, and to some extent over the preceding months, various parts of Aleppo have been hit with powerful explosions credited to Scud missiles. 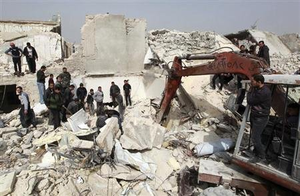 The death toll is past 100, by reports, from at least two incidents on Feb. 18/19 and Feb. 22, each with multile missiles hitting disparate areas of northeastern Aleppo or its northeastern satellite towns. The collective death toll was estimated by Human Rights Watch on the 26th as at least 141. . It's not clear whether or not the Aleppo University Attack of January 15, also apparently using Scud-style surface missiles, was related. And Aleppo is only one of many cities, mainly in Syria's north, reportedly hit by Scuds in the Scud Missile Attacks in the Syrian Conflict of December, 2012 to at least mid-March, 2013. By early March, Turkish officials were alleging as many as 90 Scuds total had been fired by the Syrian government since December. More Scuds came down at the start of March, at least. One landed near Deir Ez-Zor, well east of Aleppo, and another east of there, just inside Iraq, confirmed by local officials. A rain came down on the towns of Raqqa province, ending in 500,000 refugees in the capitol, which rebels conquered in early March -their largest taken city of the war. Even in mid-March, there's clearly no guarantee the campaign of terror is over. And neither is it reasonable to claim certainty about who is responsible for the carnage. This page is incomplete, but there is more being gone over on the discussion page. This page was last edited on 6 April 2013, at 03:05.